This view of the dwarf planet Ceres comes from NASA's Dawn spacecraft, expected to arrive at the dwarf planet on March 6, 2015. An observatory will celebrate the planned arrival of a NASA spacecraft at Ceres by streaming live images of the dwarf planet live online Friday (March 6). NASA's Dawn mission is expected to arrive at Ceres — the largest object in the main asteroid belt between Mars and Jupiter — Friday. In honor of the historic arrival, the online Slooh Community Observatory will host a 45 minute webcast featuring live views of Ceres starting at 1 p.m. EST (1800 GMT) at its website: http://main.slooh.com/. You can also watch the Ceres webcast on Space.com, courtesy of Slooh. Dawn's arrival at Ceres will be the first time a human-made spacecraft has been so close to the cosmic body. 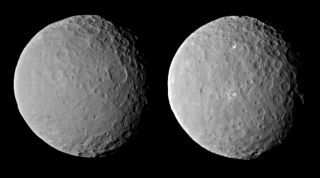 "Few astronomical events are as exciting as seeing a world up-close for the very first time; with Dawn’s imminent arrival at Ceres that’s exactly what we’ve got to look forward to over the coming days, weeks and months," Slooh host Will Gater said in a statement. "The mission should tell us a great deal about the history and composition of this enigmatic dwarf planet. And, as we’ve seen with those mysterious bright ‘spots’, there will always be thrilling surprises to investigate along the way. I can’t wait to see what Dawn will show us!" The free Slooh webcast will show live shots of Ceres from Australia. The dwarf planet should look like "a bright dot traveling against a background of stars," Slooh representative Eric Edelman told Space.com via email. Interested skywatchers in the Southern Hemisphere might be able to spot Ceres in the constellation Sagittarius now, but the dwarf planet is not bright enough to see with the naked eye, according to Slooh. "Ceres is currently lost low-down in the predawn light for those of us in northern Europe and the northern U.S. states. However the view gets better the further south you go. It’s relatively high in the sky in the hour before dawn from Sydney, in Australia, for example. At around 9th magnitude you’ll need a small telescope to see it well. It’s currently in the constellation Sagittarius, roughly 7 degrees east-and-slightly-north of the handle of the famous ‘Teapot’ asterism." NASA's Dawn mission launched to space in 2007. The spacecraft visited Vesta — the second-largest asteroid belt object — before moving on to Ceres. Scientists are expecting Dawn to beam back amazing, never-before-seen images of Ceres during its time orbiting the dwarf planet.